The week after the inspections, we decided to buy the Bayliner 3058 Motoryacht named Foghorn (I'm sure there's an interesting story there, but it's lost to antiquity). I'm sure you've already guessed that by now. We're very happy with our new boat. Yes, there were some ups and downs during the search and procurement process, but the end result is well worth it. Wayne and I went up to the Skyline Marina in Richmond for the Victoria Day weekend to stay on the boat and get to know it a better. It was great fun! Because we're going to sell our smaller Bayliner 2350 soon, we didn't want to purchase too many things to outfit the new boat. So Wayne brought a big box of things down from Powell River including life vests, a portable GPS, and tools. We bought two new sleeping bags for the v-berth bed and stopped at Overwaite (I still refuse to call them Sav-on Foods) for a picnic supper. Because we were on shore power, we could use our microwave oven (too huge for a boat) to make popcorn before we went to bed. When we get to Powell River we'll trade it for our smaller one in the condo. That'll be an improvement for both places. When we purchased our Bellingham boat from Geoff at Lake Union Sea Ray, we knew the seller and the maintenance records for the boat. Wayne and I trusted the boat we were purchasing was in good condition and free of any major defects. For that reason, and because our U.S. insurance carrier didn't require one, we opted not to get a boat survey. With our new Bayliner 3058 Motoryacht, we didn't know the seller or the boat broker, and there were no maintenance records. For those reasons, and because our Canadian insurance carrier required one, we chose to get a boat survey. Geoff also recommended that we get a mechanical inspection of the engines and legs to make sure they were in good operating order. The Foghorn (as in Foghorn Leghorn) has been moored in the fresh water of the Fraser river for several years, but before that it was in salt water and that can be quite corrosive. Wayne and I met Geoff at the Skyline Marina in Richmond, BC, where the boat is moored. Geoff helped us find an independent survey company and mechanic. 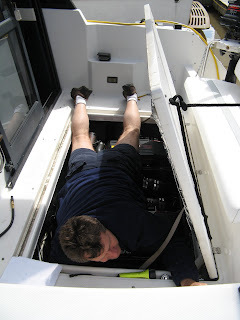 During the morning, both inspectors crawled all over the boat looking at the construction, systems, engines and condition. Then Geoff took us out to test the boat in action. The final stage of the inspection was a haul out at the marina so both inspectors could see the bottom of the boat and the stern drives. The Skyline Marina has a 30 tone boatlift, so we used that. Now that was quite an experience. All I could think was, "Don't drop it!" After both inspectors finished, they gave a verbal summary of their findings. The written reports followed two days later so we could make our final purchase decision. But the initial report was good. Buying a New Boat: We Found It! Buying a boat is a bit like love, you never know when you'll find it. We went to see a 1993 Bayliner 3058 twice. It was an individual sale through craigslist. The owner kept it well maintained and the layout was very functional. The only downside was twin 4.3L engines. We were afraid they were a bit underpowered to get the boat up on plane. But the up side would be better gas consumption at lower speeds. Before we went for a demo ride, Geoff found a 1992 Bayliner 3058 Motoryacht just north of the border in Richmond, BC. 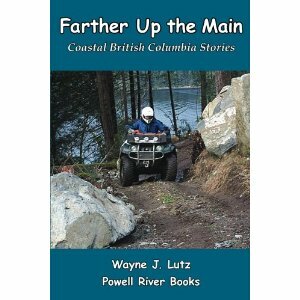 Wayne was at first reluctant to travel so far, but since it was on the way to Vancouver International Airport, he stopped by on his way home to Powell River. It was love at first sight. And it had every item on our mandatory list (including price) and almost every item on our "nice to haves" list. 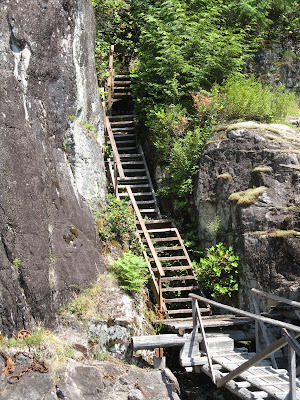 Wayne told me all about it when he got to Powell River. He was so excited. We set up an appointment for me to see it on my return trip to Bellingham. We learned that this was the boat we wanted. We also learned that not all boat brokers are as good as Geoff. After Wayne and I decided to start looking for a new boat to use on the chuck (salt chuck, ocean), we developed our mandatory and "nice to haves" lists. That helped us keep us focused during our search. The key item was our maximum dollar amount. This had to include any upgrades that might be required to make the boat conform to our mandatory list. Geoff from Lake Union Sea Ray in Bellingham was a key player in our search. He also introduced us to Yachtworld.com where we could review boats available in the U.S. and Canada. Narrowing the search to the Pacific Northwest (including British Columbia) made the search more realistic. If we purchased a boat in the States, as Canadian permanent residents, we would need to import it to Canada. This would be advantageous if we could find a boat that was less expensive south of the border. Importing a boat into Canada is fairly simple if it was manufactured in a North American Free Trade Agreement (NAFTA) country. If not, it could require expensive import duties. We definitely wanted to avoid those. In the April issue of Sunset Magazine, there was a call for readers with vegetable gardens to submit a picture to the magazine's Facebook fan page. The winners would receive a set of garden tools. 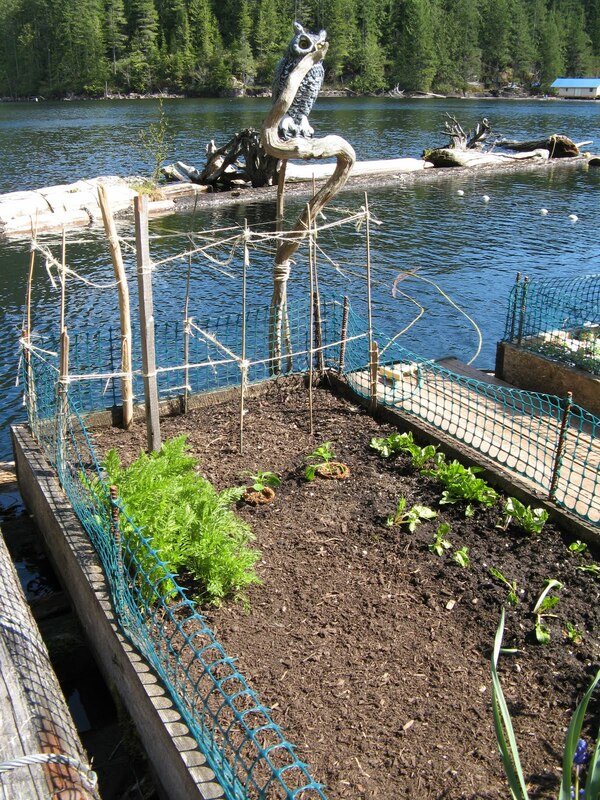 I submitted a picture of my floating garden up at the cabin, and do you know what? 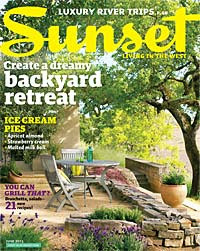 I was one of the tree winners and my garden's picture is in Sunset's June 2011 issue. What a great honour! How does my garden grow? With purple sage, red potatoes, and green lettuce all in a row. The heart of my garden is my float. It was designed and built by my good friend John. 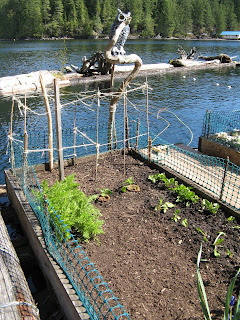 Cedar logs provide the buoyancy needed to keep four 3 X 10 raised beds above the waterline. On the bottom of the beds is a heavy cloth called mill felt. It is porous, but very strong. Frequent watering is needed in the warm summer months, so John installed a solar powered water pump and hose for me. And supervising it all (and supposedly scaring away hungry birds) is Mr. Owl. His strategic perch at the rear of the float gives him a bird's eye view of his vast domain. It's hard to believe, but at the turn of the century (doesn't that make 2000 sound like a long time ago), Wayne and I knew next to nothing about boats. In 2001, we bought our first runabout to get up the lake. In the last ten years, we've added nine more vessels of various types to our collection. So why would we want another boat? Size matters. At least when you are out on the chuck (ocean). Our primary ocean going boat has been the 23.5-foot Bayliner Halcyon Days. We love her, but the large straits and inlets of the Inside Passage have been beckoning, and the heavier seas and stronger currents made us want a more substantial boat before go. What's held us back? 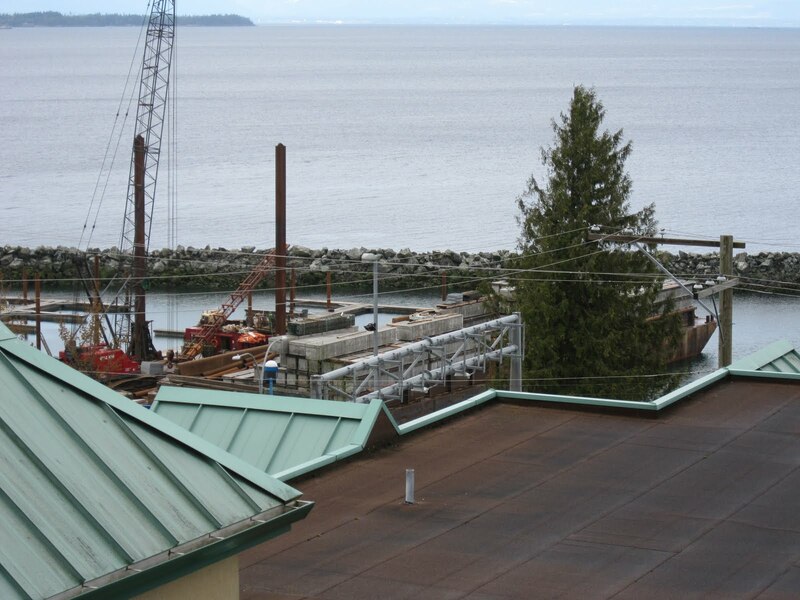 We've been on the waiting list for a larger slip in the Powell River North Harbour for about nine years. Now that the marina is being redone, the wait is over. And Jim, the wharfinger, found us one that we can see from our condo window. How cool is that! So off we went looking for a new boat. What better place to start than with Geoff at Lake Union Sea Ray in Bellingham. He helped us get our Bellingham boat a few month ago, so we returned for more of his able assistance. We searched on both sides of the border using craigslist, Yachtworld.com, and, of course, Geoff. Because of our good experience with Bayliners, we settled on three models: the 2858 Command Bridge, the 2859 Sunbridge, and the 3058 Command Bridge. To stay within our price range, we looked at boats built in the 1990's with gas engines. It's been a long time since I've written a Wednesday Friends Day post. I would like to expand my "friends" list to forums I enjoy visiting. 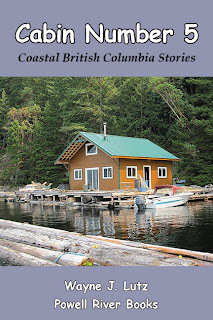 Today, I was over at one of my favourites about cabin living, the Small Cabin Forum. 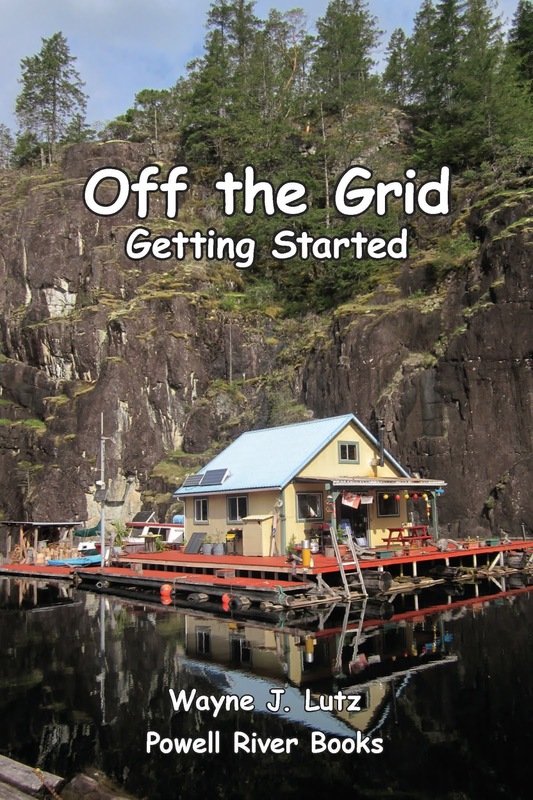 It's associated with a website of the same name that provides lots of information about cabin construction. I recommend that you visit both. I was reading some of the posts, and one of the popular threads was "Share Your Outhouse Pics." Now that might not be a topic of great interest to cityfolk, but to us cabin dwellers it's an integral part of our lives. Some were traditional, some fancy and one was a Tufway chemical toilet. I had to share mine of course. To get there I have to climb what I call the "stairway to heaven." It's four flights up a notch in the cliff. During rainy weather it shares the space with a waterfall. Up top is our outhouse. It's nothing special, just a one-holer with three plastic bins. One holds TP out of reach of nesting mice. Another holds used TP to be disposed of later. That really cuts down on the quantity of fill if you know what I mean. And the last holds lime and a spoon to sprinkle down the hole to reduce odours. We've passed many times heading north and south from the border on the Guide. Edaleen Dairy is on the west side of the road just north of Lynden. On our way back to Bellingham last week we needed to find a place to stop and change drivers. We picked the dairy parking lot and this sign tempted us inside. Last spring I planted a rhubarb bare root in a medium sized pot on my deck. It's a deep pot to allow for root growth and to help insulate them during the winter. Even so, I wasn't sure it would work. Rhubarb is a long-lived perennial plant. The directions said to not to cut any stalks the first year to allow the roots to get established. I cheated a bit and took a few to make a pie. Looks like I dodged a bullet. I would say this is a pretty good start for year two. The pot is in full sun and catches the rain. 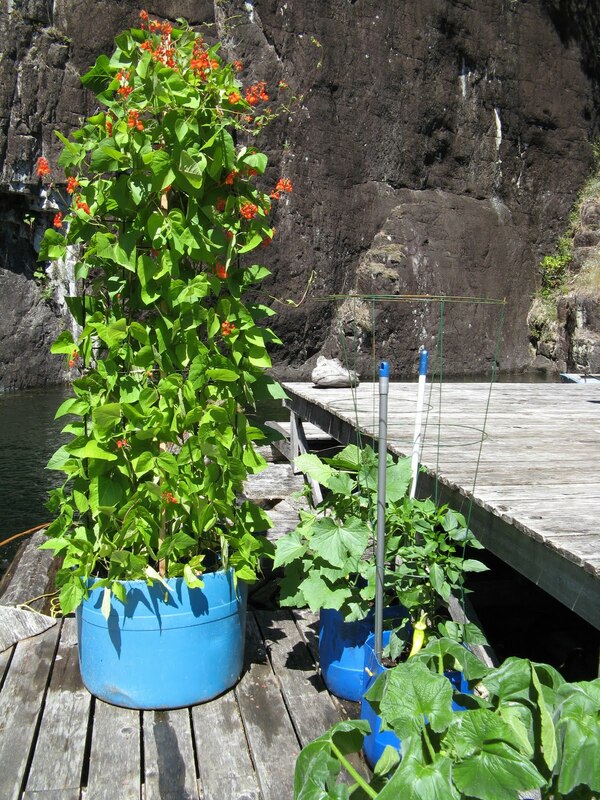 Plus, it's in a location for easy watering with a can of lake water. 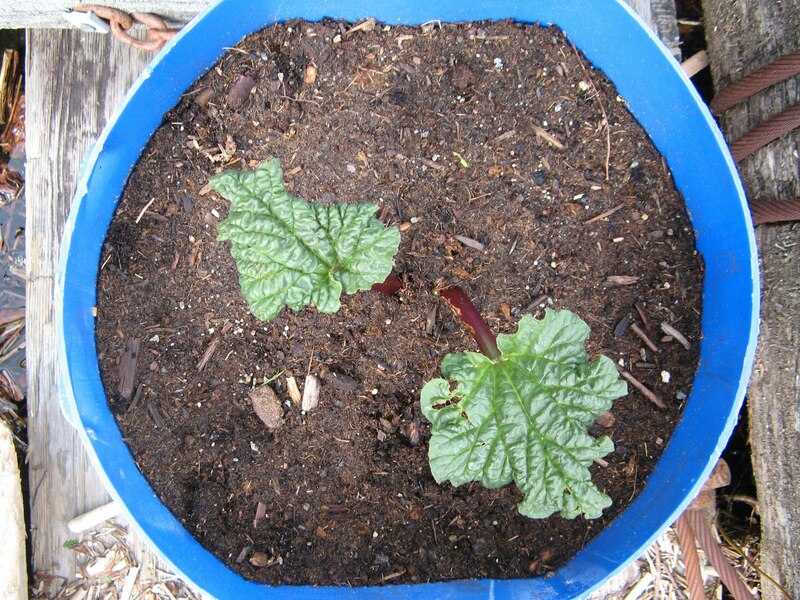 My good friend Margaret from Powell River also posted about rhubarb this week. Head on over to her blog Thistle Garden to see how easy it is to freeze extra rhubarb. Plus, she has a handy tip for using the leaves (they are poisonous) to cut down on garden weeds. Two years ago, all of the baby Barn Swallows fell from their nest to our porch roof. None survived. So last year, we gave our nesting visitors two helping hands. First, Wayne built a small wooden shelf to help support their mud nest high up under our eves. The second was a soft "landing pad" just in case any babies got pushed or fell from of the nest. I used an old sheet and sewed a large pillow. Then I took some polyester fiberfill I had from an old craft project to fill it. The fiberfill dries fairly quickly and retains its loft, making it a good choice for an outdoor "avian trampoline." To help keep the fiberfill in place, I created three pouches in the pillow. To keep it in place on the porch roof, Wayne used some strategically placed rocks. The pad has an additional benefit. At the end of the season, it can be discarded with all the droppings from the nest. We are hopeful our Barn Swallows will return by the end of May. If they do, everything is ready for them. The old nest just needs refurbishing and the new trampoline is in place. Wayne and I took a quick trip to Richmond including a dinner stop in Steveston Village, BC. It's cute with lots of shops and restaurants, but what really caught my eye was the working harbour. There were lots of fishing boats varying types. Looking at their sizes, some must fish the Fraser River and nearby Strait of Georgia. Others looked like they could handle the open seas on the west side of Vancouver Island or north to Alaska. Also, there is the Gulf of Georgia Cannery. The once busy plant that operated from 1894 to 1979 is now a historic monument dedicated to a fishing industry that has dwindled over time. It wasn't open for tours when we were there, but I bet it would be very interesting. Maybe on another less quick trip. Our cabin floats away from shore on all sides. Steel cables 3/4" thick hold it in place on two sides, and a large log called a "stiff leg" keeps it away from the rock cliff. This allows the cabin to float in place and withstand heavy wind storms. To get to shore, we have a gangplank to a transition float. This small secondary float supports our bridge to the adjacent rock wall. But when the wind blows, or speeding boats create wakes, the gangplank often falls into the watery gap. Now that I'm going to the cabin more on my own (Wayne and I are taking turns in Bellingham with Mom), I need to be able to raise the plank on my own. p.s. Doesn't Wayne's new redwood deck stain look nice? I've been growing potatoes in barrels for four years now. It's such an easy way to get a good crop of spuds. Last year, I grew two kinds, Norland Reds and Yukon Gold. I really like eating the red potatoes fresh, but for lasting, the Yukon Gold are better. We're still eating the last of last year's crop now. My remaining red potatoes have all started to sprout. But that's not a total loss. 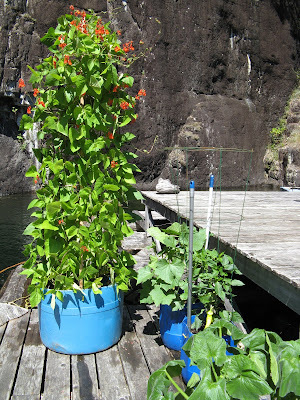 I had to buy new Yukon Gold seed potatoes, but for my Norland Reds, I had plenty of my own sprouted ones to plant. I planted two barrels of Yukon Gold potatoes. They are both on the deck of our transition float to shore. That will make it easy for Wayne to water after the spring rains stop. Last year I saved the soil from my potato barrels in plastic bags. As the potatoes grow foliage, Wayne can just dump a bag of soil on top. That will continue until the entire barrel if filled with soil. The increased depth will encourage the plants to produce more potatoes. The Norland Red potatoes went up in my hillside potato patch. I have been building up a small section of soil up on the top of our granite cliff with my compost, decomposed leaves from the forest, and bags of peat. In addition to the potatoes, I am trying garlic. The land-based critters have left my potatoes alone. Hopefully the garlic won't be to their liking either. Last week when I went home to Powell River BC, I took Pacific Coastal Airlines as usual. It was a beautiful sunny spring day. Our base turn highlights Harwood Island and cloud covered Vancouver Island in the distance. Lining up on final approach the Catalyst paper mills slips by and a tiny glimpse up Powell Lake means I'm almost home. Air travel is very important for Powell River. 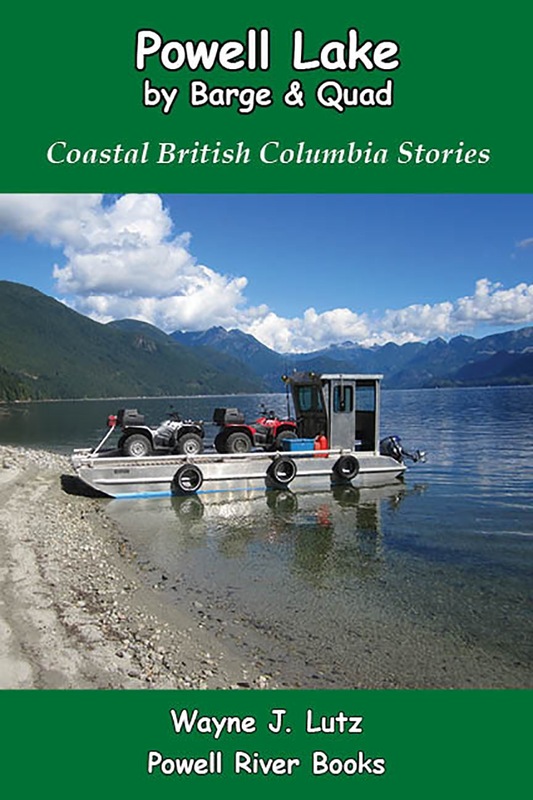 Even though the city and region are on the mainland of Coastal BC, the area can only be reached by air or sea. Powell River Airport serves as a commercial and private hub. In addition to the regular Pacific Coastal Airline flights, you will see helicopters supporting the logging industry and a multitude of private aircraft. Getting ready for spring gardening meant I needed to do some clean up first. I let my strawberry plant foliage die around the roots for mulch to protect them through the cold winter. But it makes spring cleaning quite a chore. After clearing away the dead leaves, I surrounded the surviving roots with broken egg shells to thwart a slug invasion. Unfortunately, only one of my strawberry beds survived. Grubs got to the roots of the other one. I have two perennial asparagus beds in my garden. I usually wait until the picking season is over and the ferns are tall to build a support system. This year I wanted to have it ready for Wayne so he could easily take care of it in my absence. Some stakes (provided by the lake) and string and it was quickly done. In addition to my perennial asparagus and strawberries, I have ongoing herbs and flowers. And I didn't have the heart to pull the remaining carrots and chard from last fall. But in the remaining space, I planted onion sets and seeds for chard, spinach, kale, lettuce and carrots. Hopefully, they will hardy enough to produce with less care and watering over the summer months. If not, at least I had the fun of trying.